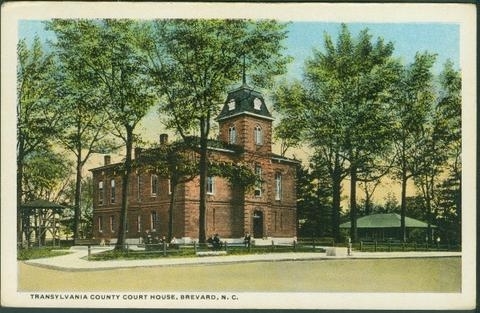 Here is a photo of an old postcard depicting the Transylvania County Courthouse in Brevard, NC. I lived most of my earliest years in Brevard or nearby. My brother Eugene was born July 4, 1944. I was 21 months old, not even two. My earliest memory dates from before this brother’s birth. We lived in an apartment off Turnpike Road in Brevard. Mrs. Seay was the landlady. (I probably learned that a little later.) In the 1980s I went to an apartment with a friend who owned some rental properties in Brevard. I remembered having lived in that neighborhood and after looking around a bit I recognized that apartment. It was still there, with steps leading up the side just like I remembered. We had lived there a few years. I was probably five when we left. This earliest memory is vivid. My mother was eating peanut butter out of the jar while sitting on a log in front of a high wire fence enclosing some chickens. I remember that she asked me if I would like to have a baby brother or sister. At that time, of course, you didn’t know what you were getting. I don’t remember how I answered her. But I do remember later the baby, lying in his crib. I thought he was very fine. I remember giving him my “cracker bug,” a small metal toy, placing it in his crib. Mama took it out soon and told me it was dangerous for a baby to play with. And it was. It had sharp edges and would be outlawed now for a child of any age. I remember after that, walking with Mama from where we lived on Jordan Street to my cousin Sue McCall Metcalf’s little house on Maple Street. Part of our route was on a trail through a wooded area. I wish I could remember where that wooded area was, but I can not. I remember the flowers I found. Mama called them Johnny jump ups, but they were either sea oats or something similar. I also remember at Sue’s they found the prettiest green snake you ever saw. Another memory from that time is when another cousin, Hazel Moses, was in Brevard. I am not sure why she was there as she lived at Lake Toxaway as far as I know. Mama took me and we visited Hazel at a big brick house in Brevard. They took my dress off me and put me in Hazel’s son’s (Bradley’s) sailor outfit and took my picture. I did not like it at all. Why did they do such a crazy thing? I have no idea. Mama and Hazel were both pretty young. Maybe they were just doing something stupid. This episode probably sounds like a child’s overactive imagination at work; however, I have the photograph to prove this story. I will find it and post it later. Back then we walked everywhere we went. Daddy did not have a car. He walked to work at the hosiery mill in town where he was the machinist.